Background: Danofloxacin is a synthetic antibacterial agent with broad spectrum antibacterial and antimycoplasmal activity which is widely used in aquaculture. Methods: A UPLC (Ultra Performance Liquid Chromatography) method was developed and validated for the determination of danofloxacin (Dano) and its major metabolite N-desmethyl danofloxacin (Ndesmethyl Dano) in muscle plus skin tissue of European seabass (Dicentrarchus labrax) for the first time. For the separation an analytical column UPLC BEH C18 2.1 × 5 mm (1.7 µm) was used with an isocratic mobile phase consisting of MeOH-water acidified with formic acid (0.01%) (18:82; v/v) and flow rate of 0.3 mL/min within 5.5 min. The detection was performed at 275 nm using a photodiode array detector for both compounds. Examined fluoroquinolones were isolated from seabass muscle and skin tissue by extraction with acidic ACN and further purification with the QuEChERS methodology. Results: Recovery rates from muscle and skin tissue ranged between 90.2 and 101.2% for both compounds. The detection limit of the method was estimated at 13.73 µg/kg for Dano, 18.32 µg/kg for Ndesmethyl Dano, while the limits of quantification were 41.62 and 55.52 µg/kg, respectively. The developed method was fully validated in terms of selectivity, linearity, accuracy, precision, stability and sensitivity according to the European Union Decision 2002/657/EC. Conclusion: The new developed and validated method can be readily applied to aqua cultured fish after dietary administration of danofloxacin. Keywords: Danofloxacin, metabolite, fish, seabass, residue analysis, QuEChERS, UPLC-PDA. 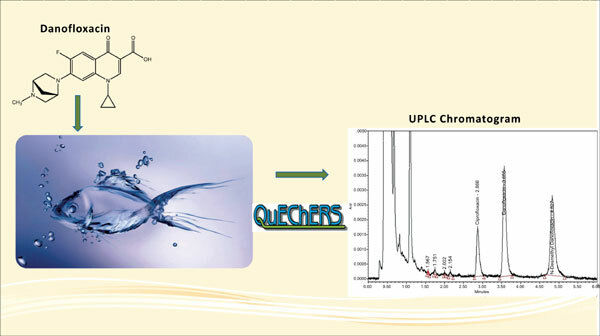 Keywords:Danofloxacin, metabolite, fish, seabass, residue analysis, QuEChERS, UPLC-PDA. Abstract:Background: Danofloxacin is a synthetic antibacterial agent with broad spectrum antibacterial and antimycoplasmal activity which is widely used in aquaculture.